As an iceberg makes its way through the St Lewis Inlet in Southern Labrador, the tides and wind take it for a wrong turn where it became grounded along Great Caribou Island. The end of its journey has halted for the time being but the iceberg may break free once it shrinks as it slowly disintegrates. 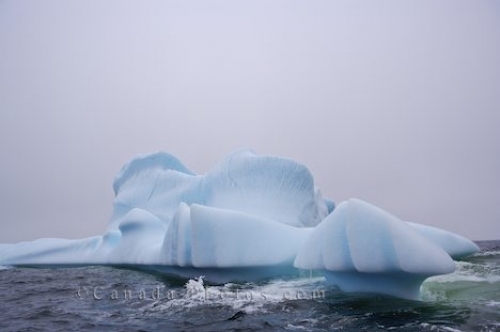 Iceberg grounded along the coast of Great Caribou Island, near St Lewis Inlet, Atlantic Ocean, Southern Labrador, Labrador, Canada. Picture of an iceberg grounded along the coastline of Great Caribou Island in the St Lewis Inlet in Southern Labrador, Canada.